Published by University of California Press Ltd. Hard Cover :350 pages. The permanent troika of acclaimed Independent-film director James Ivory, producer Ismail Merchant, and prolific author and screen- writer Ruth Jhabvala played an invaluable role in bringing India and Indian themes with Indian culture on the screen for Western audience. 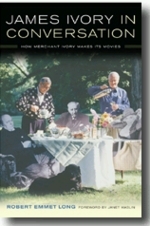 Their creative partnership, Merchant Ivory Productions, of over 40 years resulted in a 40 plus films output and made it into the Guinness Book of World Records. They made documentaries and feature films in several continents-India, America, England and France. Because of their high reputation they were able to get cream of the British theatre actors to act in films like ‘Howards End’;’A Room with a View’; ‘The Remains of the Day’ etc. In India, their filmography includes The Householder(1963); Shakespeare Wallah (1965);The Guru(1969);Bombay Talkie(1970); Autobiography of a Princess(1975); Heat and Dust(1982); directed by James Ivory, a three time Academy Award nominee for Best Director; and In Custody (1994); Cotton Mary (2000) and Mystic Masseur (2002),which were directed by Ismail Merchant. Their lush period pieces, many being literary adaptations of classics and other quality films, made on a minimal budget, were full of entertainment and literary content, mutual fascination and incomprehension of other cultures. While films like ‘Shakespeare Wallah’ and ‘Heat and Dust’ were graceful, funny, had exotic locales, sumptuous furnishings, and nostalgia of the dying British Raj, Brits with ingrained attitudes about caste and class, ‘In Custody’, ‘Mystic Masseur’, and ‘Cotton Mary’ deal with impact of dissolution of a rich language on Indian culture; poverty and squalor, drunken poets, pimps and prostitutes, aftermath of colonial rule and displaced and insular Indian community recreating India in far off Trinidad. Director/screen-writer, Ivory is full of praise for his celebrated collaborators Ismail Merchant and Ruth Jhabvala. Ruth, who has a formidable reputation as a writer is commended by Ivory, “She brings a secure, a profound grasp of character and story.” She won BAFTA Award for ‘Heat and Dust’ and Academy Awards for Best Screenplay for ‘A Room with a View’;’Howards End’, and Oscar nomination for ‘The Remains of the Day’. He lauds Ismail for his prodigious energy, vitality and enthusiasm. He has a great sense of humor; has a great talent for extracting money from financiers, is happiest when directing or cooking. Ismail Merchant, who passed away in May 2005, was not only a renowned producer/director but also a gourmet cook well known for getting the film cast and crew together at his gigantic feasts. He also wrote numerous books on cuisine. He won several international accolades and honors for his outstanding contribution to cinema. Film buffs may find it interesting to learn that stage and ‘cross-over’ super suave and handsome Shashi Kapoor and talented actress/ cookery writer Madhur Jaffrey(won a Best Actress Award for her role in ‘Shakespeare Wallah’ at the Berlin Film Festival in 1965 acted in many of the Merchant Ivory Production’s India films; Satyajit Ray, acclaimed film director of the ‘Apu Trilogy’ helped with editing and composing the musical score for The Householder and Shakespeare Wallah. ; Ray’s cinematographer Subrata Mitra wielded the camera in four films, and Ravi Shankar, Ali Akbar Khan, and Ustad Vilayat Khan also helped with music in some of the films. Of all the above films, ‘Heat and Dust’ was perhaps their most successful collaboration for many reasons including timing of the release. Around that time; films ‘Gandhi’, ‘A passage to India ‘two major TV series ‘Jewel in the crown’ and ‘The far pavilions’ had generated lot of interest on India, so ‘Heat and Dust’ also received rave reviews.